Alternative to this deal for those that have a Poundland nearby. a quid for a calculator, this simply doesn't add up!! Wonder if Poundworld would price match? Philip Hammond could do with this. HOT - I've got one of these - has lasted for years! The conservative calculator has been broken for years. Even though they have more money than ever before from draining resources from whatever service they can, and raising taxes and reducing spendature, the calculator still says there is no money. Love a good, basic calculator. Boobies! 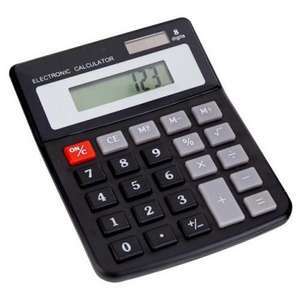 Is it really solar or does it have a battery and fake solar panel like so many other cheap calculators? Mine has probably been going for 10 years now, sitting in the corner of the room away from the window. Pretty mad that this is only slightly hotter than the other deal though and shows how influential some posters are/how poor the site is becoming. No need to expose your political and economic ignorance on a deals site - best to keep it for your next Momentum meeting. £868 for a gaming laptop (your last post ) doesn't sound like someone suffering from 'austerity'!